When you see Turkey Burgers on a menu at a restaurant you think, “Oh this will be healthy I can have this.” Be careful what restaurants don’t tell you is that they buy the fatty meat of turkey. Most meat in restaurants will be the 80/20 but when you buy it in the store you can get a healthier ground turkey such as 90/10 or 93/7 and save thousands of fat grams, saturated fat, and calories. The Turkey Burger at Ruby Tuesdays has 700 calories and 40 grams of fat. You also have to be careful at fast food places like Carl’s Jr. their Turkey Burger has 490 calories and 23 grams of fat. 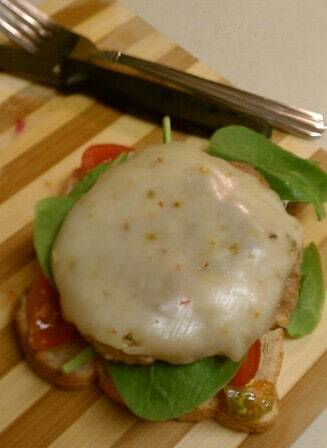 My Spicy Pepper Jack Turkey burger is a cheap healthy recipe that you can make at home and save you more than half the fat and calories that other restaurants serve you. Also what is great about this recipe is you can make extra patties to take as a quick healthy lunch or a quick healthy dinner for later in the week. Just wait to put the cheese on till after you have reheated the burger. Just make sure you double up the recipe to make more burgers. With summer in full force here I like to take my cooking outside to the grill. Some people get a little nervous grilling but just follow a couple of quick tips and you will be grilling in no time. If you are using a charcoal grill there a couple things you need to do. One place the coals to one side of the grill don’t spread them throughout the bottom of the grill. This allows you to have one side over direct heat and the other side will still get the heat but will not burn the outside so it’s on the indirect heat. Two you want to let the fire burn down and the coals turn white before you place the meat on the grill. With doing that you will save you and your guests from burnt turkey burgers. Another tip is to leave the meat alone, you do not need to flip the burger 100 times just to get it cooked. Just flip it a couple times and leave it to cook thoroughly. Now you are ready to try out your grilling skills! Preheat the grill to medium-high or the grill pan to medium-high heat. One the grill is heated brush a light layer of olive oil on it or use cooking spray as directed. If you are using a grill pan spray with a little bit of cooking spray. Season your patty with the 1 teaspoon of Mrs. Dash Onion and Herb, and salt and pepper to taste. Place you patty away from direct heat (if grilling) and let it cook for 5 minutes each side or until no longer pink. After the burger is cooked place the cheese on top and let it cook for one more minute. At this time I like to toast my buns as well over the direct heat (or toaster if inside). Do not leave them unattended because they will burn quickly.